The Oxford shirt is a true classic that can be worn all year round. Characterized by its visible weave, the Oxford shirt is highly durable. For these reasons, and many more, a tailored Oxford shirt is a wonderful investment or gift for anyone. 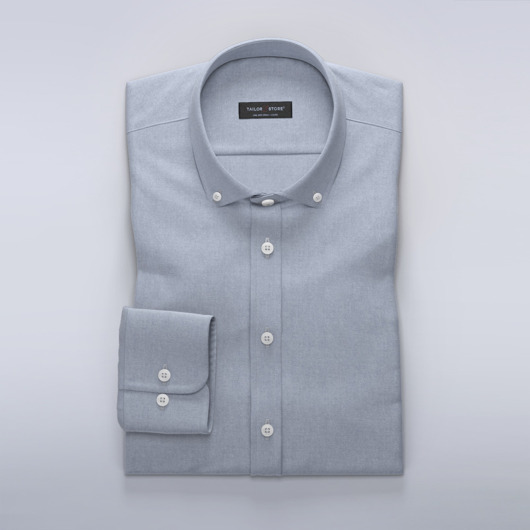 Our range includes Oxford shirts for both the office and the weekend. As with all our Oxford shirts we take great care to select soft and durable fabrics that feel superb on the skin. Always popular, Oxford shirts are some of the best casual shirts to have ready in your wardrobe. Daring, dapper, always adaptable Tailor Store proudly presents our made-to-measure Oxford dress shirt collection for men. Live the moment: Experience the stylish versatility of strong oxford cloth cut-and-sewn to the dimensions of your body. Perfect as smart or casual wear all-year-round, our men’s Oxford shirts are only made from superior, highly durable, symmetrically woven thread. Make it yours: Personalize every detail of your tailored Oxford shirt with our easy to use shirt designer. Wear it your way: Buttoned or unbuttoned, sleeves up or down, any look is possible with a tailored Oxford shirt. Surprising as it may sound, Oxford shirts do not originate from Oxford. The name Oxford shirt derives from the original basket weave production method. First made in Scotland in the 1800s, the Scottish mill which pioneered Oxford cloth, created four fabrics and named them after the world’s most revered universities: Harvard, Cambridge, Yale and Oxford. Compared to cotton, Oxford fabric is thicker, stronger and symmetrically woven. This gives Oxford shirts a noticeably assuring structure, quality and weight. Beyond the thread, perhaps the most iconic feature of the oxford shirt is its button-down collar, which proves especially effective in keeping the neck area looking crisp, whether a tie is worn or not. The fabric has white threads in one direction and colored threads in the other. The fabric is a bit thicker than a traditional shirt fabric and has a clear and symmetrical texture. The weaving type is called basketweave. How should I wear my Oxford shirt? The Oxford shirt pairs well with chinos, sports jackets, denim, shorts, the list goes on. For this reason the Oxford shirt is a superb choice for all occasions, whether formal or relaxed. A classic Oxford shirt has a distinctive casual style with a button-down collar. As a casual everyday shirt, it can be worn to a wide range of places or events. Depending on what it is paired with, an Oxford shirt can work perfectly at the office or music festival. An Oxford shirt in a slightly thinner fabric such as Pinpoint Oxford is especially recommended as a versatile business shirt. Style your Oxford shirt with chinos, jeans or even shorts. Easy to wear, flattering and adaptable, the Oxford shirt is a must in every man’s wardrobe. For ultimate individuality, why not create your own, truly personal, Oxford shirt? Try our design tool and experiment with different collars, cuffs and contrasts. No matter what your choices are you get a fully made-to-measure Oxford shirt from Tailor Store, that can’t be experience anywhere else.